When you need a tow in Parkersburg, WV, and the surrounding region, it can be a confusing and stressful time. Who are you going to call? How long will it take to get your car towed? This is where Pifer’s Service Center Towing & Recovery can assist you to make your experience less stressful. For most people, getting a vehicle towed is not fun or convenient. So, we make the process as easy as possible for you, because we really care about you and your vehicle. 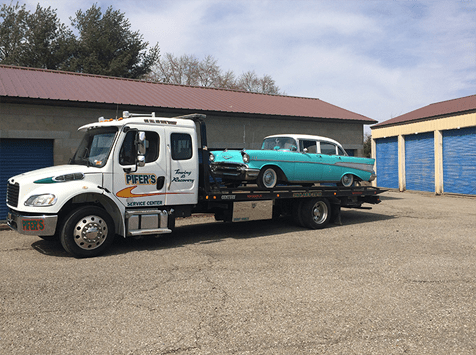 Our first-time customers have loved dealing with us, and they have called us again when they need light towing or roadside service. We also provide heavy equipment towing. So, give Pifer’s Service Center Towing & Recovery a call at (304) 489-2010 for our 24-hour, seven-day a week emergency services. Pifer’s Service Center Towing & Recovery has you covered in Wood County and neighboring counties in the western region of West Virginia, including Jackson, Tyler, Calhoun, Doddridge, Wetzel, Marshall, Pleasants, Wirt, and Ritchie counties, as well as Athens and Washington County, OH. We are prepared to travel to wherever your location is in those counties, so long distance service is not a problem. Our drivers are familiar with the Interstate 77, Route 50, and all other local roads in the western region of West Virginia and eastern region of Ohio, and the trucks are equipped with a GPS device. We will also stay in communication with you just to make sure of the location. Whatever your towing needs, Pifer’s Service Center Towing & Recovery’s trucks are equipped to handle your vehicle without causing any more damage. Our professionals have been trained to deal with a number of problems, and they have the right tools to attend to your vehicle emergency 24 hours a day, seven days a week. As soon as you make the call to us, we will dispatch one of our trucks to your location, and will update you on the truck’s time of arrival. Contact us right away when you need our services! When you are stranded by the side of the road, Pifer’s Service Center Towing & Recovery can assist you to make your experience less stressful. For most people, getting a vehicle towed is not fun or convenient. So, we make the process as easy as possible for you. We have many other services, including hauling, 24/7 emergency service, jump starts, flat tire repair, and more in Parkersburg, WV, Ravenswood, WV, St. Marys, WV, Belpre, OH, and beyond because we really care about you and your vehicle. Our first-time customers have loved dealing with us, and they have called us again when they need a tow. At Pifer’s Service Center Towing & Recovery, we are able to haul light, medium, and heavy equipment and vehicles in Parkersburg, WV, and surrounding areas. We arrange the logistics of everything from the simplest haul to the most challenging hauling job. Whether you need generators, boilers, condensers, turbines, or other equipment hauled to a location in the region, we can do the job right and without damage to the equipment. Call us when you need something hauled.